Take US-131 north through Manton. Take M-113 west toward Kingsley. Turn right (north) at the blinker light in Kingsley. Take Garfield Rd. north to Traverse City (approximately 15 miles). Turn left at the next traffic light into our main entrance. Turn right at the next traffic light into the campus entrance just past the Cambria Suites Hotel on your right. Take I-75 north to Grayling. Take M-72 west through Kalkaska to Acme (approximately 25 miles). 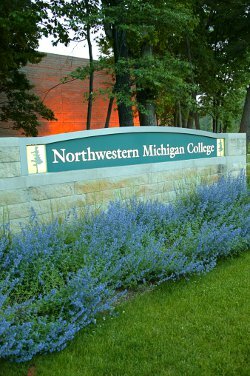 Once on campus, the Cedar Parking Lot on the right is the nearest one to the Welcome Center in the Tanis Building, the Biederman Building and the Health & Science Building, where many NMC departments are housed and classes are held.